"What Does Corporate Governance Regulation in Hong Kong Teach Us About Incremental Legal Change?" 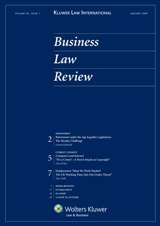 Abstract: Why does regulatory change occur much more slowly in some jurisdictions than in others? In this article, we look at the gradualist pace of Hong Kong’s corporate governance-related regulatory reform – particularly with regard to shareholder protection. We extend the concept of ‘legal transactions costs’ to explain such slow change. Costs of learning, experimenting and satisfying various constituencies about the advantages to their own interests of such reform represent some of these legal transactions costs. We describe how such legal transactions costs have worked against the creation of a minority shareholders’ association, the professionalization of board-directorships and the incorporation of soft law provisions in the Hong Kong Stock Exchange’s Listing Rules into hard law. We describe what the end result of such reform might look like – to assess the gap between current and possibly reformed corporate governance.